Your baby has nearly arrived and you can’t wait to hold her in your arms. But there are still some key elements missing from your breastfeeding plan, including a breast pump. This particular model has caught your eye, but you aren’t sure if it is right for you. Our Ameda Purely Yours Breast Pump Reviews should help you decide whether to take the plunge or keep searching for your perfect pump. Togetherness is a wonderful thing when it comes to moms and newborns. But sometimes, life interferes with your plans to see your newborn as much as you would like. Things like work, emergencies or medical issues can cause you to be away from your baby at her mealtimes. You’ll need a good breast pump to stockpile breast milk so your significant other can handle the feedings when you can’t be there. Not everyone needs to buy an electric breast pump. You can get by with just a manual pump if you plan to pump milk less than once a day. If you plan on pumping once or more a day however, you should invest in an electric breast pump. Price: Don’t spend more than you are comfortable with. Portability: If you plan on taking your pump out of the house, you’ll want something you can pack up easily. How hard it is to clean: With your precious baby around, you won’t want to spend one extra minute cleaning. Make sure your pump is easy to clean. How hard it is to figure out: If solving a Rubik’s Cube is easier than putting your pump together, you’ll want to consider another model. The Ameda Purely Yours double electric breast pump has adjustable speed and suction so every mom may be able to find a setting that works for them. A dual hygiene-kit milk collection system is included with this pump. This kit helps ensure that milk goes in and bacteria stays out of the collection system. This pump can be operated by battery power or an outlet. This unit gives you the option of pumping one or both breasts at the same time. Being able to control the speed can reduce discomfort for some women. This machine is fairly loud which might be a drawback if you are pumping at work. The suction isn’t the best. The adjustable speed and suction is one of this machine’s selling points. It gives mothers more options when they are pumping, which may help them find a less painful and more successful way to express their milk. Some mothers may find that the slower speed draws out more milk and is less painful too. This pump is portable and lightweight, meaning you can take it with you on a trip or to work without any fuss. The dual hygiene-kit milk collection system helps give you peace of mind. This kit can take some of the panic out of whether your unit is storing breast milk in a sanitary fashion. The last thing you want to do as a mother is give your child tainted breast milk. The unit comes with a carry-all tote that can help you transport your baby’s milk. The kit doesn’t contain BPA or DEHP. Many moms are familiar with BPA, but DEHP is another compound moms will want to avoid (source). Because it is a double pump, you can pump both breasts at the same time, or just do one at a time. Moms are always in search of time-saving tips, and pumping both breasts at once will save a few minutes off each pumping session. For an electric pump, this one is a solid choice for the money. The suction doesn’t seem to be as strong on this unit as it is on many other electrical pumps, especially after long-term use. The pumping suction doesn’t always seem uniform between both sides – one side can sometimes seem to pump more strongly than the other. Keep tinkering with the speed and suction settings to find the correct setting for you. Finding a way to create the proper suction can be a challenge. Moms who are worried about emergencies should feel fully prepared with this breast pump. This is because it can be operated with an outlet, batteries or even a car charger. All three methods are simple to use, and because the unit is so lightweight, it is a cinch to carry it out to the car in case of emergency. There are no intimidating buttons or strange-looking parts on this pump. It’s easy to figure out how to operate and simple to clean. When you are a new mom, the last thing you want to do is spend extra time trying to take apart all the pieces of a machine so you can be sure it is thoroughly cleaned. With this one, you may be able to get a catnap instead of wasting your time with a complicated cleaning process. It fits any standard sized bottles. That means if you have already purchased your bottles, but you are still stumped when it comes to selecting a breast pump, you can still consider this unit. Women who have had bad past pumping experiences may want to check out the Philips AVENT pump which is gentler on the breasts than some other brands. Moms who want to keep their hands free to pay bills, talk on the phone or flip through a magazine may want to consider buying the Freemie Freedom, which uses concealable breast milk containers that can fit inside bras. 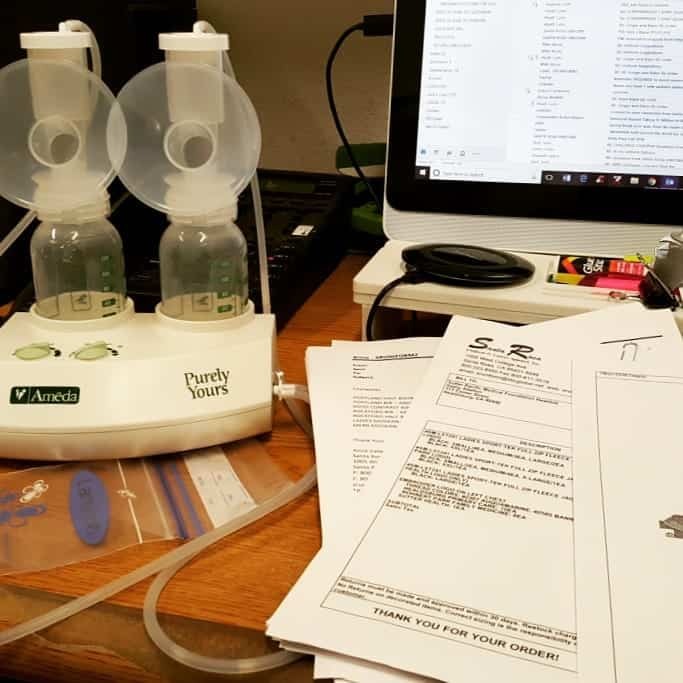 Moms who hate to clean tubing on breast pumps might like the Lansinoh breast pump which uses a closed system that won’t allow milk to leak into the tubing. Moms who want to avoid longer pumping sessions may prefer the more aggressive suction of the Pump In Style. It can express milk in mere minutes. Moms who want a pump that is so quiet they’ll forget it is on – other than the constant squeezing of their breasts, of course ­– might want to consider the Spectra S2. For the price, Ameda Purely Yours offers moms a hygienic way to pump their breast milk. That’s important because keeping our babies safe is our number one priority as moms. The pump is light, portable, easy to clean and it comes with the carry-all tote that will keep all the pieces together. Moms who don’t have much time on their hands for pumping would be best off buying a double electric pump, like the Ameda Purely Yours Ultra, if they plan to express milk several times a day. This closed system has a Proven Airlock Protection feature to safeguard your baby’s health by keeping bacteria, viruses and even mold away from the breast milk you are pumping. Tends to lose suction over time. Every part that touches your breast milk is BPA free and DEHP free. You can use the pump with an included power cord or with 6 AA batteries. The pump can also be used with a car adapter that can be bought separately. The Purely Yours Ultra pump is simple to figure out how to operate. Although it comes with instructions, you shouldn’t have any trouble figuring out which parts go where. The built-in bottle holders are a great feature because the bottles used with some pumps are easy to tip over and spill. There’s nothing more frustrating than going through the time, expense and trouble of pumping, and watching all your hard work vanish right before your eyes when your collection bottle accidentally gets knocked over. Although this pump is a little loud so it might not be a great option for pumping breast milk at work, it is extremely portable. Because it is so lightweight and easy to pack up, it’s a good option for taking with you on vacations or weekend getaways. If you choose to pump at work and you don’t like to draw attention to yourself, you might want to invest in the car adapter so you can express without having the telltale noise of the pump let everyone know what you are doing. The system employs a silicone diaphragm which stops milk from flowing into the pump’s tubing. That means there is less chance your milk will become contaminated during future pumping sessions. The HygieniKit has been approved by the FDA as a way to keep breast milk separated from outside air. It has Proven Airlock Protection to keep your breast milk safe and untainted. The closed system is a big perk because it amps up the safety of your breast milk for your baby. Plus, it makes cleaning the pump easier because fewer parts touch your breast milk – unlike some other pumps where milk sometimes flows back into the tubing. Less cleaning time makes for a happier mom. If you plan to be pumping for a long time to come, you might like that this pump doesn’t seem to lose suction over time. If you want to pump milk at work and on the go, you may prefer the S2 because it is quieter. If you’re on a tighter budget, this might be the right pump for you as it is a lot more affordable. If you need to pump at work or in public, you might like the fact that this pump allows you to express milk while fully clothed. If you are looking for something cheaper, this pump is a good choice. 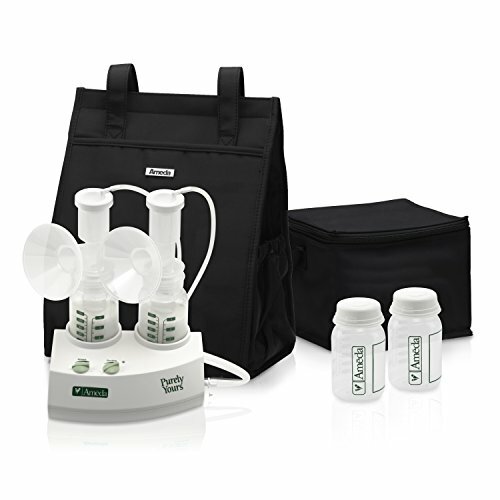 Double electric breast pumps that provide enough suction to get the job done can be expensive. If you don’t have enough suction while breastfeeding, you won’t express as much milk and it might eventually cause you to kick breastfeeding to the curb. The Purely Yours Ultra offers the suction you need at a middle-of-the-road price. The closed system ensures you won’t spend all your free moments during the day taking your breast pump apart and cleaning it. I was given an Ameda purely yours pump through my medical insurance (Kaiser). I’ve had it 2 weeks and am supposed to be primarily pumping so I can measure the amount my baby receives. The pump is losing suction and I have to say I would not recommend this pump to anyone. Medela is the way to go! My lactation consultant at the hospital also preferred medela.